You can import brush presets that you previously exported from Harmony. In the Tools toolbar, select either the Brush , Pencil or Eraser tool. Open the Brush Preset menu and select Import Brushes. In the browser window that appears, navigate to and select the .xml file in which you exported your brush presets. The Import Brushes dialog box opens. 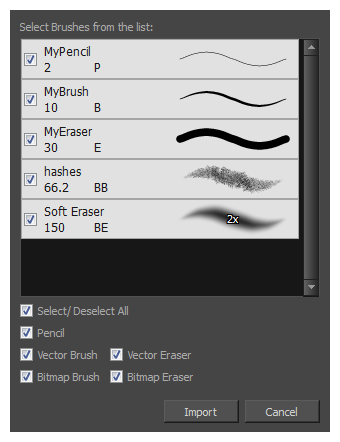 The imported brush, eraser and pencil styles will appear in the Presets list.